THE Commonwealth War Graves Commission (CWGC) marked the end of the centenary of the 141-day Battle of the Somme t at its Brookwood Military Cemetery on Friday. CWGC Vice Chairman Vice Admiral Sir Tim Laurence was joined by Woking Mayor Anne Murray and a host of community groups who took part in the Commission’s Living Memory Project, which encouraged people to rediscover their war heritage and remember those who gave their lives. The Chepstow Singing Club were in fine voice, while CWGC historian Glyn Prysor delivered a moving talk. Community group leaders also spoke about the Somme war graves they’d discovered in their neighborhoods and how they are encouraging local people to commemorate those who died during both world wars. They were handed certificates by Sir Tim. Ian Burrows, a piper from the Royal Scottish Pipe Band Association Northern Ireland played his exclusively composed Living Memory lament, which led guests to the Brookwood Memorials. Colin Kerr, Director of External Relations for CWGC, said: “Our Living Memory Project across the United Kingdom has been a great success and we want to make sure that those who died during both world wars, and are buried or commemorated in the UK, are never forgotten. “We discovered we have more than 140 Somme casualties buried here in Britain, and we have connected with so many communities up and down the country. “We hope that the British public will continue to remember the fallen by visiting their local war graves to commemorate the sacrifice that the men and women of both world wars made. 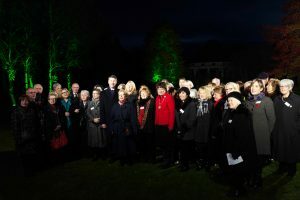 The Commission’s Living Memory Project, in partnership with Big Ideas Company -which specialises in projects that bring groups together – was funded by the Department for Communities & Local Government and the Department for Culture, Media & Sport. Virginia Crompton, CEO Big Ideas Company, added: “To mark the Somme centenary, the Living Memory Project invited communities across the UK to champion their war graves. The response from schools, faith groups, music and sports clubs and many, many others has been amazing.